School kids giving their best for some world competition has always made good fodder for feel-good, inspiration and entertaining documentaries. Spelling bees, ballroom dancing have successful source material and now science projects in a typical school science fair. Hopefully these projects will do the world a change and make it a better place. Yes, the children are our future! SCIENCE FAIR follows nine high school students as they navigate rivalries, hiccups and triumphs on their journey to compete at the 2017 International Science and EngineeringFair (ISEF) in LA. As 1,700 of the smartest, quirkiest teens from 78 countries face off, the stakes are high for the fair’s $75,000 top prize. The film does well to make the subject personal as these students are interviewed and tell the camera their aspirations and goals in life. The audience sees these kids as both highly intelligent talent as well as normal children wanting to have a good time while attaining their goals. Choosing which nine students from the seven million that try to qualify for ISEF must have been a daunting task for directors. And why 9? 9 seems an appropriate number to show differences and variety in the film. I am sure whichever 9 the directors would have picked – the nine would still be interesting – so it is clear the most charismatic the ones chosen the better and the more eclectic the better, which appears to be the case in the film. 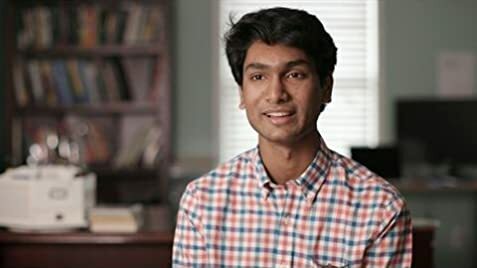 Among the 9 students: A West Virginia math whiz nearly failed algebra, yet he taught a computer to rap like Kanye West. At a sports-obsessed South Dakota school, a Muslim girl turns to the football coach when she can’t find a teacher to serve as her research advisor. In a poor Brazilian area, two friends identify a protein that inhibits the Zika virus. In Germany, an aeronautics fanatic redesigns a century-old wing. But will it fly? Then there’s the Kentucky trio who invent a new kind of stethoscope and, from the same school, a child prodigy who deals with a set-back. There is nothing wrong too with a touch of nostalgia. Also interviewed are 93-year old Dr. Paul Teschen, winner of the first-ever national science competition in 1942, and Dr. Nina Schor, the first girl to win after boys and girls were allowed to compete against each other. Script is by Jeffrey Plunket, Costantini and Foster. Costantini and Foster also collaborated on the award-winning short documentary Death by Fentanyl. the scene. Foster was a science kid too, but he admits that the level at which Costantini competed was another world. She even skipped going to the junior prom with her high school crush so she could compete at science fair. Dedication and obsession! 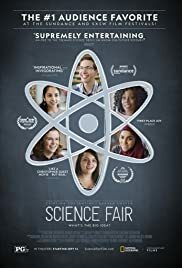 SCIENCE FAIR is a very entertaining and inspirational documentary that went on to win the Audience Award winner at both the 2018 Sundance and SXSW festivals. SCIENCE FAIR is not the kind of doc that would go on to win the Oscar for Best Documentary but the best thing is that it is such a pleasurable and easy yet inspirational watch.